Galway, Limerick, Cork, Belfast and Dublin are the five cities that will visited next summer as part of the Inside Making a Murderer 2 Irish Tour. 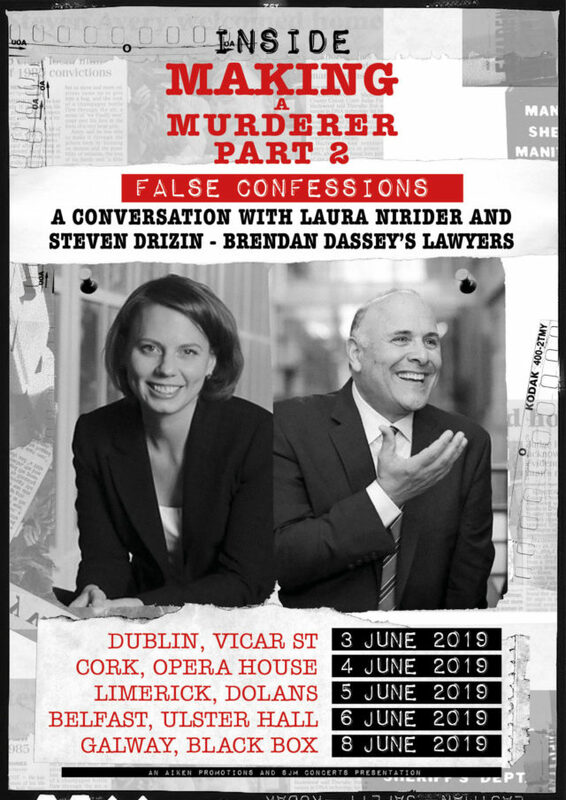 Aiken Promotions proudly presents Inside Making A Murderer 2 - False Confessions: A Conversation with Laura Nirider and Steven Drizin - Brendan Dassey’s Lawyers featured in Making a Murderer 2. It will kick off at Dublin’s Vicar Street on 3 June hosting five nights throughout Ireland, ending in Blackbox, Galway on 8 June. Tickets €30.00 / £29.00 inclusive of booking fee are on sale this Thursday at 9AM from Ticketmaster. In addition to her courtroom work, Nirider regularly publishes scholarly and practitioner-focused articles on interrogations and post-conviction relief. In partnership with the International Association of Chiefs of Police, she has co-authored one of the only existing juvenile interrogation protocols. She is also a frequent presenter on interrogations at defender and law enforcement training conferences around the country and has been featured in film and television programs on interrogations. Steven Drizin is a Clinical Professor of Law at Northwestern Pritzker School of Law where he has been on the faculty since 1991. He served as the Legal Director of the Clinic's renowned Center on Wrongful Convictions from March 2005 to September 2013. At the Center, Professor Drizin's research interests involve the study of false confessions and his policy work focuses on supporting efforts around the country to require law enforcement agencies to electronically record custodial interrogations. Drizin co-founded the Center on Wrongful Convictions of Youth (CWCY) in 2008, the first innocence organization to focus on representing defendants who were only teenagers when they were wrongfully convicted. Drizin and former student Laura Nirider, who directs the CWCY, represent Brendan Dassey, a central figure in Netflix's smash docuseries Making a Murderer.